Hi all! I'm rather new here (I'm no pro) but I found a trick recently that really helps me when sniping. I wanted to share it and ask if this is a method commonly used by other players. I play mostly glass cannons (Strv S1, Borsig, and the like) that are meant for sniping, so this might not happen to everyone, but I figured that anyone who has ever tried to shoot a quickly moving tank from 450+ meters away knows the pain of missing horribly, despite taking the time to stop, completely aim your gun, and lead your target perfectly. Trying to hit a B-C 12 t moving 60+km/h at that distance? Just plain stupid. However, in the instance that you're sniping, have no other valuable targets, and really need to get rid of a scout that's distracting your team- sometimes you just gotta shoot it. 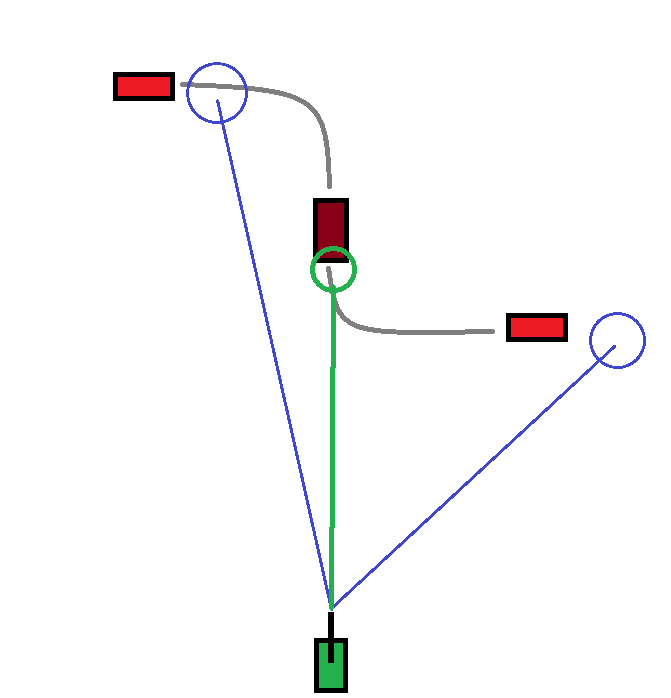 Point is, the red square represents a moving enemy light tank, the green square is you, the blue lines and circles represent your line of sight and reticle when trying to lead the target (with auto-aim off), and the green line and circle is your reticle when using auto-aim and waiting for the tank to be facing you. When choosing to lead the target, you create a lot of room for error that is destined to fail you (RNG, shell velocity, light tank randomness, etc.) However, when you click auto-aim on the target and wait for them to face you, you mitigate a lot of the RNG and drastically improve your chances of landing a shell into them. I've noticed that light tanks very commonly travel in these zig-zaggy patterns (usually like a sine-wave) to avoid fire, meaning that, if you're standing still (not a good tactic for up close!) the tank will eventually be travelling directly towards or directly away from you, at which point, if you auto-aimed, would be the perfect time to shoot. I don't think this would be very possible (let alone reliable) without the use of auto-aim. I've only tested this on the Strv S1 and the Borsig, however, so I'm not sure how fantastically this would adapt to other tanks since I'm still really new and have only partially gone down a few of the lines. However, even with an insane shell velocity like on the Strv S1, I still find this to be much better than trying to lead a target, and these fast moving lights are usually the only tanks I have problems leading from range. I could see people opposing this tactic since it uses the auto-aim by saying that it reduces the amount of skill you need to hit a target that should be very hard to hit, for obvious balance reasons, but I think it still does require a good bit of skill, especially with <1200 m/s shell velocity, because you still have to be very intuitively aware of your tank's shell speed and how it travels to different distances. That being said, it does remove much of the shield of RNG that prevents light tanks from getting hit at such long distances when scouting, but, in my opinion, is not nearly enough of a buff to give tanks with terrible shell velocities (sniping KV-2s, anyone?
) the ability to hit fast targets at long range.